Valentino Beauty Pure believes in nothing more than offering you the highest quality products. 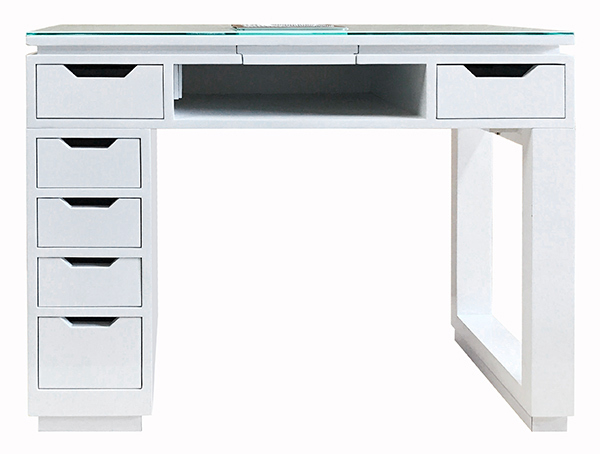 Our LUX Manicure Table is a great way to spruce up any salon, spa, or beauty school. It comes with our full feature Flush Mount XL nail dust collector included, a high gloss enamel finish, and tampered glass. Shipping is also included to the Continental United States. Dimensions: L 40" x W 17" x H 33"
50,000 Hour Warranty on Valentino Beauty Pure Flush Mount XL Fan. Valentino Beauty Pure furniture is UL Listed, CSA approved for the United States and Canada, and CE approved for Europe. Disclaimer: Minor paint imperfections are possible.